1/ Using teeth with slight colour variations. 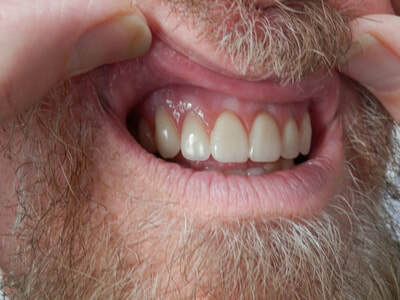 2/ Setting the teeth in a slightly irregular pattern. 3/ Custom tinting the gum to give a more natural appearance. 4/ Carefully selecting the size and colour of the teeth. If you have a photo of yourself with your natural teeth, this can be a huge help. Making a great set of dentures means the dental prosthetist and the client have to work together as a team to get the best result. The photos below are the same case. 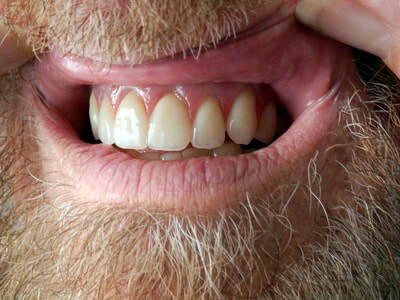 You can see how natural the gums look in the mouth. 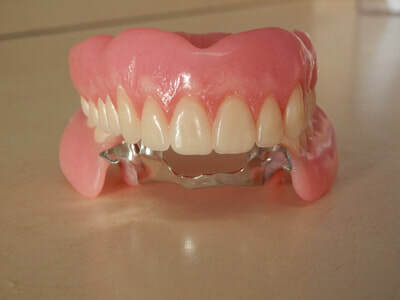 Pictured is a full upper denture and a partial lower with a metal frame.